Name this chef and win three jars of BBQ sauce, two empty tin cans and a kilo of pebbles. Bonus Round: To win a cellar filled with butterflies, tell me what the items in the first picture have in common with each other. Be back with the answers on Tuesday! The items in the first picture are both brown. And I suspect both were cooked in your air fryer. As a child I ate our dog's biscuits - and I love potatoes so the third thing they have in common is I like them both. Colour me clueless about the chef though. What made you eat them? Fair play. The dog ate my cereal. I know that chef!! I just can't recall his name. I know he has a big nose, a Russian accent (I think it's Russian) or Serbian or something like that and he's hilarious. I haven't a clue about the dog biscuit and fruit unless the common ingredient is seeds. Still no clue about the dog biscuit and date, unless one goes in and one comes out. Real name is Bronson Pinchot. ❤️ Thank you, Dr. Theda. To you as well. Cheers. The brown objects have the same ingredients. I'm going to have to go with a dog biscuit, but I imagine the answer can't be that easy. I knew the chef before seeing other answers. 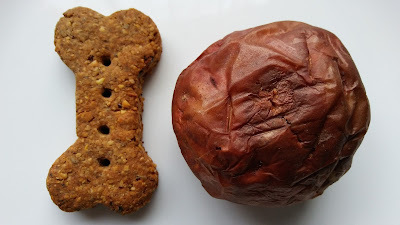 As for the dog biscuit and round thing-a-ma-gig, I suppose they both belong with a dog, having that in common. No idea on any of it. I can't remember "the chef's" name but I know those boys do the Dance of Joy together! And both things in the first photo are doggy treats you make for your pups. Only I know are dog's cookies ! Not a clue. At first, I thought it was the Soup Nazi from Seinfeld, but no. Daughter made the best dog cookies for years. The recipe came from Three Dog Bakery. This was many many years ago. All the dogs went crazy for the cookies. So there are dog cookies and a old funny TV show. If I win can I not be called boogerbut ? I'm guessing that the first image is doggie treats! Homemade goodness for your fur babies. And that second image is a scene from the TV show Perfect Strangers. 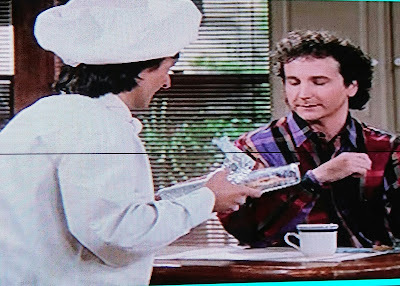 The chef is Balki. I don't remember his last name. I used to watch that show! It goes waaaaay back. And it was fun! The first pic looks like home made dog treat. Don't know what's sitting next to the dog bone. The second pic is of a show that was on a long time ago so I have no idea. This first one--they are both edible. :) I dunno the chef, but I can tell it's from a TV show. Can't wait to see the answer!!! Hope your weekend has been good, we managed to do some walking in-between the rain showers! Dog treats? Brown? Dried? Dates? Am I close? LOL! I loved watching that tv show!! Big Hugs and Happy Spring! They both must be chewable. I'm not sure I'd like to do the chewing, but I have a friend I might be able to convince to do it.